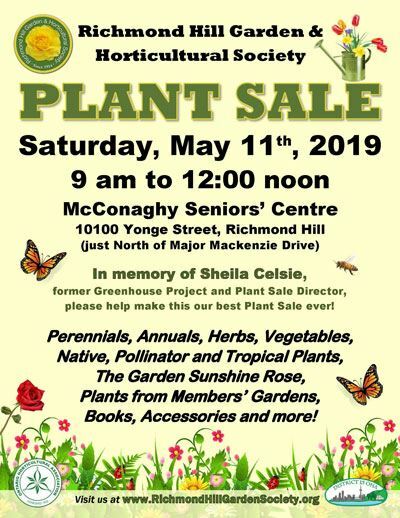 Our 2019 Plant Sale takes place on Saturday, May 11th, from 9:00 am to noon at the McConaghy Seniors' Centre in Richmond Hill at 10100 Yonge Street. A variety of plants are available at great prices, including Perennials, Annuals, Herbs, Vegetables (including heirloom varieties), Native, Pollinator and Tropical Plants. This year's sale also features a limited number of our very own Garden Sunshine Rose, pictured on our society's logo. Most of the plants offered for sale are grown in Richmond Hill by our members, either in greenhouse space provided by a local high school, or in the gardens and homes of our members. A large Gardener's Bargain Table features additional items such as gently-used books and plant containers. Helpful pamphlets about gardening for butterflies and other pollinators will also be available, free of charge. Never been to one of our Plant Sales? Click here for photos of our 2018 sale. Click here for photos of our 2017 sale. Click here for photos from 2016.